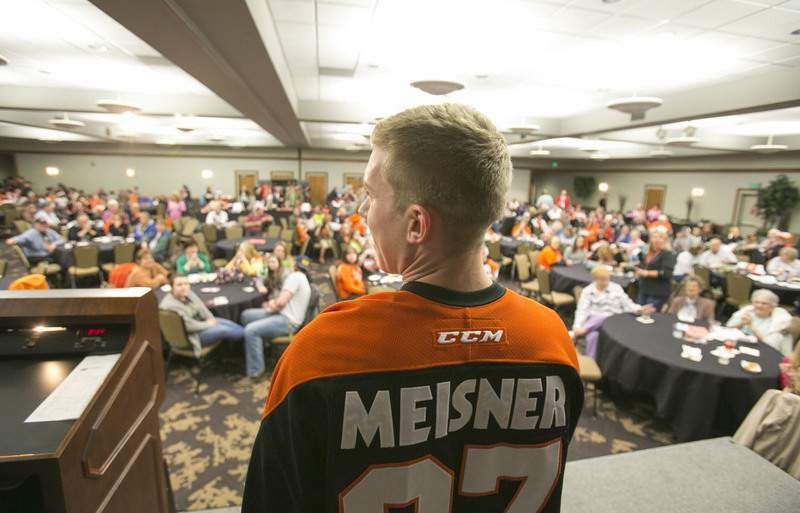 File Komets goalie Ben Meisner stands in front of the crowd as fans bid on his game jersey at the Komets' annual end-of-season party at the Memorial Coliseum Expo Center in 2014. In a story for The Players Tribune, former Komets goaltender Ben Meisner opens up about his struggles with mental health that got so bad he came close to taking his own life. Meisner, 28, wrote that he’s suffered from depression, anxiety and obsessive-compulsive disorder, and that getting the needed support as a minor-league hockey player isn’t always possible. You may recall him collapsing on the ice in a game in 2014. In hindsight, it may have been an anxiety attack; he got a clean bill from cardiologists the Komets said at the time. “For a lot of guys down in the minors, deciding whether to reach out for help becomes a lose-lose proposition. If you speak up and tell someone that you need to miss time for an injury that’s not necessarily visible — no broken ankle or sprained wrist — not only do you lose your spot on the roster while you’re out, it could mean that you lose your job as a professional hockey player altogether,” he wrote today.